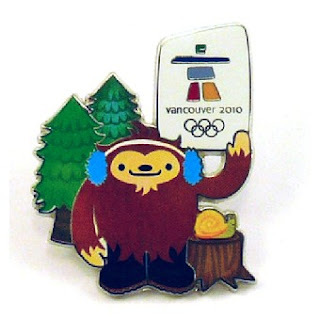 The 2010 Winter Olympics to be held in Vancouver, BC, Canada, BELIEVES in Sasquatch. 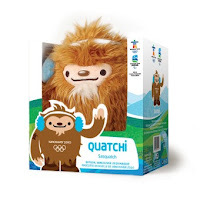 Or, Bigfoot believes in the Olympics, in an official mascot role, complete with an overly cute product line featuring plush stuffed figures, lapel pins, commemorative coins, t-shirts and other goodies guaranteed to improve your love life. 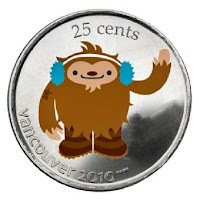 "QUATCHI," as the fuzzy little, ear-muffed character is called, is an appropriate choice, as this area of Canada is the true birthplace of wider awareness of North America's favorite cryptid hominoid, predating the "birth of Bigfoot" in 1958 by at least three decades. J. W. Burns, working on the reserve of the Chehalis Indians, some sixty miles east of Vancouver, coined the adaptive neologism, "Sasquatch," back in the 1920s. Derived from the various First Nations names for the creature in which they shared common belief and culture, it soon became the accepted name for the being. The Games run from February 12th to the 28th. View the QUATCHI product line through their official merchandising site, The Olympic Store. Click on the "Mascots" tab to see the other cutsie critters supporting the Olympic endeavor. This last week was a busy one, and some of you may have noted that we lagged in posting a new blog entry. Since then our humble Bigfoot's bLog has been listed as a featured "Best Bloggers on BF Research" selection on the newly revamped and ever-cool BFRO (Bigfoot Field Researchers Organization) website. Web hits have doubled, sometimes tripled here since then. Thanks to you, Matt and Bobo!!! We are certainly humbled to be in the same row with Autumn Williams, Cliff Barackman, Daniel Perez and Scott McClean, the Blogsquatcher and Loren Coleman! BFRO NEWS FLASH! 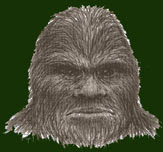 The BFRO now has a YouTube account, and you can view some of the best video evidence for Bigfoot out there for free, including, now posted, the "Squeaky footage from North Carolina, 2009," which was taken by investigator Mike Green, and first shown publicly at the Yakima Bigfoot Round-Up (personally, we find this one very interesting and quite credible). Check it out! : BFROVIDEOS CHANNEL. Fortuitously, bigfooter "Crazy Ian" (BFF) of Redding was in town, and we rallied back to our plans without those losers. First we had a good talk with the local Willow Creek Forest Service ranger, Jim (tip: he has great Bigfoot stories, and he keeps the Six Rivers Forest Atlas topo books in his desk, and they ARE for sale; the office is just down Hwy. 96 a half mile from downtown Willow Creek). Our first main order of business was to interview Mr. Hodgson. Al was there in the very earliest days of Bigfoot in the Willow Creek area. He knew Jerry Crew before the famous 1958 footprint casts were made. 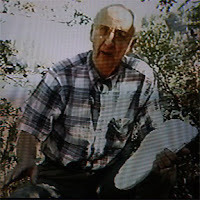 He was the one who called Roger Patterson about the trackways found up on Blue Creek Mountain in 1967, a fateful call that led to the capture of one of the creatures on 16mm film up on Bluff Creek. Without Al it could be said that there would have been no PGF. Anyway, now, thanks to Al, there will no longer be any grounds for the so-called "Bluff Creek Massacre" theory. He has REFUTED ALL of it, including the odd notion that Bob Titmus was there gunning down a Bigfoot family. The interview went on for over two hours, so it will be a while before we have finished transcribing it. Look for the AL HODGSON INTERVIEW coming soon to this blog! Watch out, GCBRO, Paulides, Short and Davis--you're in for a challenge! Image: from Google Earth, showing the site near the lower center. Click to enlarge. 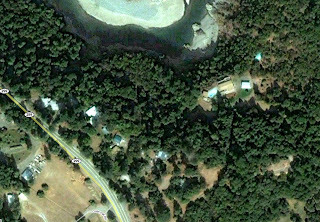 We blogged back in September 2009 about a sighting east of Willow Creek, just past the little hamlet of Salyer. See our previous post HERE. The resident, "Fisherman" Ken Hodges, had reported to us back in May of that year encounters in the Fish Lake area, near Bluff Creek, which he believes are evidence of a migratory Bigfoot family group. Read that blog entry HERE. Back on September 11 of that year his now 15-year old daughter had a sighting in the forested yard of their family home. 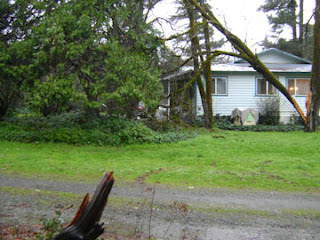 Having gotten to know them better since then, we were invited to their residence to investigate. 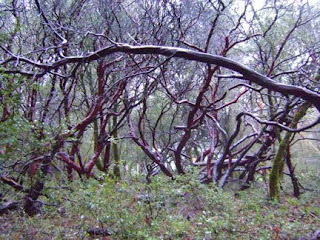 Sitting on the front porch steps of her house with a friend, the daughter, Kimberly, kept hearing the sound of snapping twigs coming from the bushes at the front of a creepy miniature manzanita forest to the east of the house. 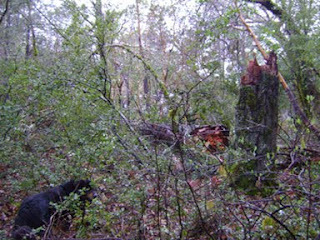 They sounded like broken branch sounds rather than something treading on the debris of the forest floor. Looking over she saw something dark crouching down among the understory. Initially she thought it was a bear; but then when she started looking at it the thing reached up an arm toward a branch above and stood up on two legs. The father, Ken, stood on the spot and demonstrated the arm reach for us. Kimberly assured us the thing was way taller than her father, and about four feet wide at the shoulders. It was in the evening, with the sun down behind the mountain to the southwest, but there was still light. The creature looked back at her, just standing there, but no facial features were detectable from that distance. She and her friend saw it. Her friend suggested she go into the house and grab a crossbow, just in case. When back outside the creature had retreated back into the back woods. 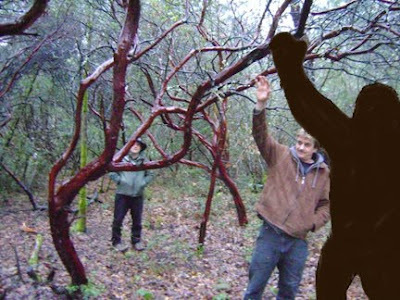 Images: Above, rough height comparison between 6-foot 4-inch Mr. Hodges and the ostensible nearly 8-foot tall Bigfoot; the view from the creature's end, toward the front portch; below, the spooky, squatchy manzanita thicket into which the creature withdrew. Kimberly was too shy to be photographed for this blog, but she went with us exploring the sighting area with her father and told us fuller details of the event than we had previously heard. Fur was noted to be shaggy, not short, maybe four inches long. No out of the ordinary odor was noted. It moved very silently when retreating. She did not observe the creature's retreat, but later her father found what he assumed was the Bigfoot's trackway of escape, with foot marks smudged into the ground where the creature had been squatting, and impressions along the route back into the woods. 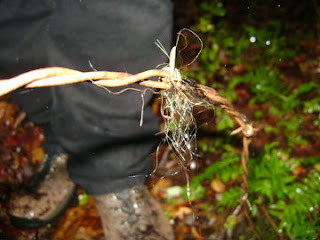 We found longish hair snagged on some barbed wire back in there, and retrieved samples for analysis. It was clearly not that of their family dog, who was also with us on the investigation. The hair was black and greyish in color. It could have been from a bear. It was found on the escape route of the creature, though, and along a clearly notable game trail heading from the south toward the thicker woods and the Trinity River below--a very clear transit corridor for animal life in the area. We were shown a couple of old impressions in the ground, still holding the basic shape of a large foot, with a distinct heel area and possible toe prints. They were not clear enough to cast, nor to get a decent photograph, but one could put a foot down onto the top leaves and forest debris and feel the footlike shape beneath dwarfing one's own shoe size. 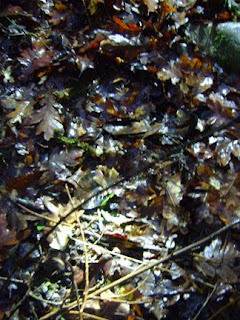 Images: The as yet inconclusive hair find; below, an old footprint, the best photo we could get in the failing light, contrast revealed with an angled flashlight; at bottom, the deeper back woods leading down to the river, with attractive grass for deer, and a dirt driveway creating a natural bottleneck for animals using the aforementioned game trail; far below, the dog that beat the cougar goes squatching. From this point Mr. Hodges told us about some things that might to some seem the product of an active imagination; but with the confirmation of his obviously sincere daughter's sighting description his words become doubly compelling. He describes repeated and apparently increasing anomalous activity going on across his home site that seems to indicate not only habitual use of his land by a group of the "unknown" creatures, but also possible growing habituation to human presence. During the first couple of years living at the location he didn't notice much, but when he started in these past two years the practice of camping out in his own backyard during the warm parts of the year he began to notice things. Most notably he claims nearly nightly sounds of the banging together of flat river rocks, which produce a distinct clacking sound. These unique-sounding rocks would have had to have been carried up from the river below. He notices that they are often associated with odd deer behavior, as the animals flee at the sounds. He thinks that the Bigfoot creatures may be hunting the deer that are numerous on his land. He believes, based upon the evidence he hears and sees, that there is a group of the Sasquatches, with one driving deer down to the waiting ambush from the others. We asked about this, but he says that no carcasses, bones or gut piles have been found. As the land is bordered to the west by steep rock cliffs, and to the east by a wider highway, more homes and a highway rest stop, the wooded land he lives on can be clearly seen as a natural corridor from the mountains to the river. Rock hurling incidents have also occurred on the site, with one larger one flying horizontally out of the woods and almost hitting a friend of his who was sitting at a bonfire in the fire ring in the front yard. Mr. Hodges reports also the odd occurrence of small pebble-sized rocks hitting and clacking against his metal front door once he has closed it behind him after smoking a cigarette out on the porch at night. He thinks that the creatures are possibly observing him and the family's activities from the bushes to the south from his front porch. Hodges assures us that no neighbors or mischievous kids have been frequenting his yard; and, besides, none of these neighbors stand seven-foot-plus tall, nor are they covered in brown shaggy hair from head to big foot. Ken Hodges is determined to get images of whatever these nocturnal visitors are in the warmer months coming up, when the activity always increases. He will be calling us as soon as the first instance occurs, so look to more updates coming in the future! Just so you know (based on comments on the BFF), the rest stop is a little ways down the road from the site. Here we were trying to emphasize how the home site is fortuitously located for wildlife (Bigfoot?) access from mountain to river. Numerous bears and mountain lions have been sighted around there as well, including one cougar that got into a battle with the family dog (the dog won and treed the cat). As one drives out of Salyer there is a precipitous drop from cliffs down to the river. No animal could use this way, and besides, the roadway would trap them and prevent escape, so narrow as it is. Coming down into the Oden Flat area the land flattens and opens, so deer and other creatures are very common moving through there. To the east of the property the highway widens and has less forest cover around it. This is our theory as to why the creatures frequent this particular corridor. There HAVE been roadside sightings along there in the past.The roadside rest would be a good place to squatch for the CURIOUS ones who might wonder what the humans there are up to. Ken Hodges is a lifelong resident of the area around Willow Creek, and has spent most of his life in rural areas and out in the mountains fishing, mushroom gathering and camping. He knows a lot of the people, for instance, in The Hoopa Project. He is a fount of Bigfoot information that is derived from experience here, not from reading the books or watching TV documentaries. We are hoping to get the BFRO involved on this one soon, maybe get some thermal video ability on-site, once any new activity is reported.There have been other sightings reports from up on Waterman Ridge, just north of the Hodges land, so this situation seems very promising. Me say it before, me say it again. Never trust hu-man. They come with camera, they come with gun, they tell lie and drive over Bigfoot home with truck, they steal land, cut down tree, take all and leave mess behind. Why you think me hide? It NOT from fear, it from disgust. They make film, try make money, they even worse than pig. They not smell bad like Bigfoot supposed to smell. They smell bad like bad moral, no care for anything but city slicker selfs. Me speak. You listen if you smart. You want find Bigfoot you be like Him, walk silent and carry big stick. Bonk bonk on the head! 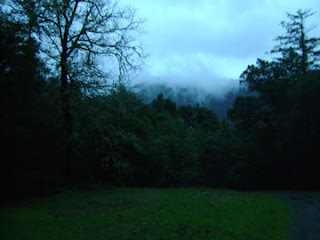 This blog text and site investigation images copyright Steven Streufert and Bigfoot Books Intergalactic, 2009. They may be quoted and used with full citation and blog link. Thanks!